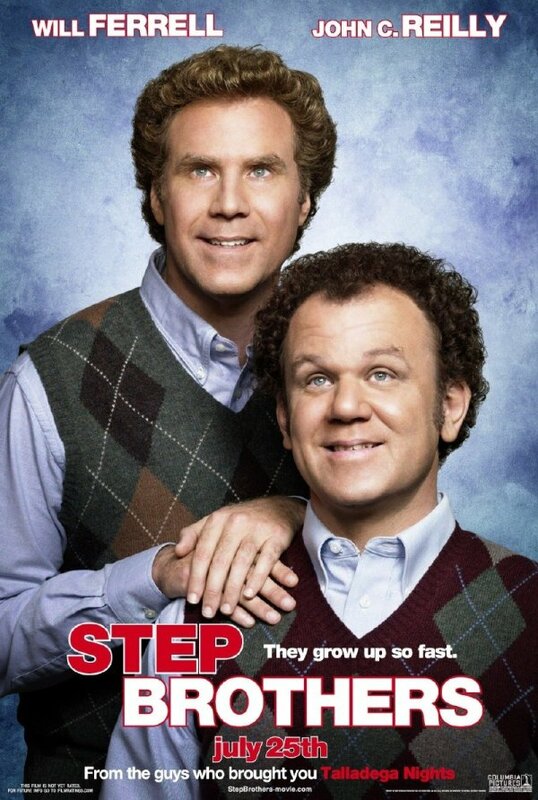 This poster for Step Brothers follows the same type of simple and minimalistic design we have seen in several recent comedies, especially in the ones somehow associated with Judd Apatow. Just show the main characters, don’t add a bunch of extra elements. They may sport a a funny expression, but it should still feel like a normal expression, and not like they are trying to make a funny face. Use amusing but not over the top clothes. Use a simple and not too attention grabbing background. Too sum up, go for subtle instead of obvious. This is the approach that was used in the posters for The 40 Year Old Virgin, Knocked Up and Superbad, for example. It worked well in those, and I think it works very well here too. Will Ferrell has the perfect face and expression for this type of image. John C. Reilly doesn’t do as well, he seems to be trying to hard. But it still mostly works. The two definitely have chemistry together, which is apparent even in a still image like these. And the matching clothes are just the right kind of dorky. I think it’s funny to compare this poster with the poster for Mike Myers’ Love Guru, which is also a character close up, but which goes for a much more obvious kind of humor. This poster just feels a little outdated to me, like something that was funny years ago but that we have overgrown. Then again I didn’t really like Austin Powers back in the day, and those movies were huge. This plays too many of the same sensibilities, so perhaps the Power’s audience will eat it up and make the film a big success. We’ll see. Nice blog here! Also your web site lots up fast! What host are you the usage of? Can I get your affiliate hyperlink in your host? I wish my website loaded up as fast as yours lol.